The LDP63000-S series has been discontinued. Please see the ILD-SP as a possible alternative or contact our sales department. The LDP63000 Series is a versatile display that can increase productivity by offering the plant floor or production area a large visual display of their current status. 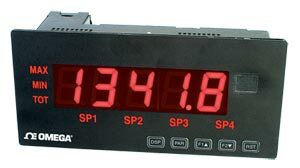 The LDP63000 display accepts various analog inputs through the use of input modules which allow the unit to adapt to most any application. Process and strain inputs can be field scaled over a range of -19999 to 99999 counts with floating decimal point. Additional plug-in option cards can add alarms, analog output, and communication/bus capabilities, making the LDP63000 a truly intelligent panel meter. 참고: Comes with mounting bracket and complete operators manual.